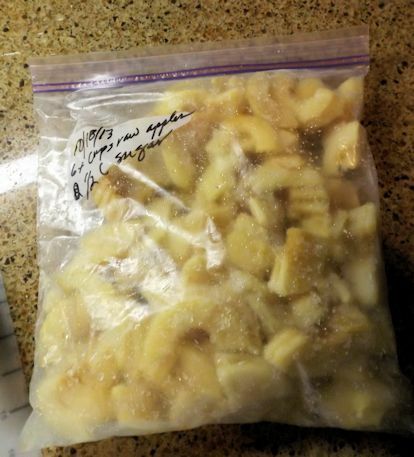 Last October I froze bags of apples for use during the year. 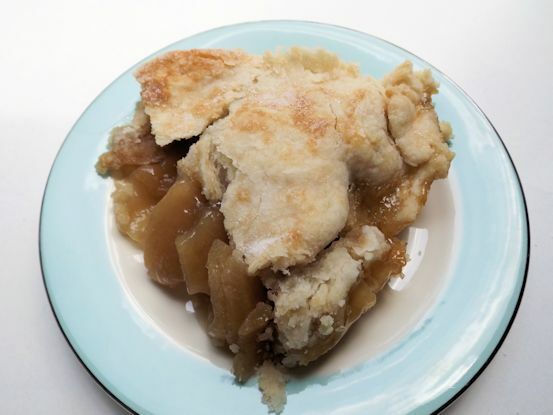 Recently, I noticed that I hadn’t been using them up very quickly so today was apple pie day. 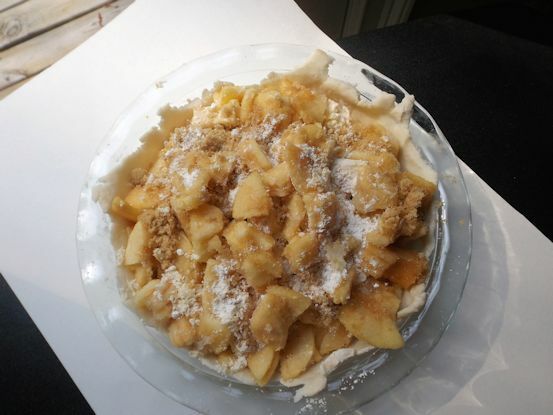 I originally froze the apples in 6 cup batches with 1/2 cup sugar. Today, it was easy to pull out the bag, add a few more ingredients, and have a great pie. 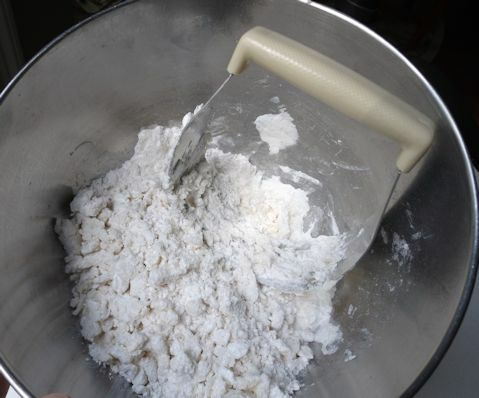 Mix together the flour and salt. Add the shortening and cut with a pastry cutter until particles are pea-sized. Switch utensils to a fork. 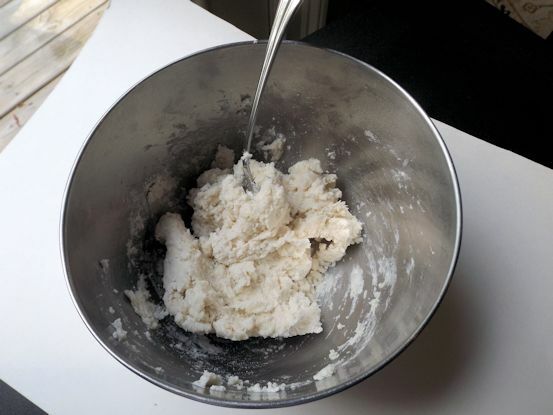 Add in the water a few tablespoons at a time until pastry just holds together. Let it rest for 10 minutes. 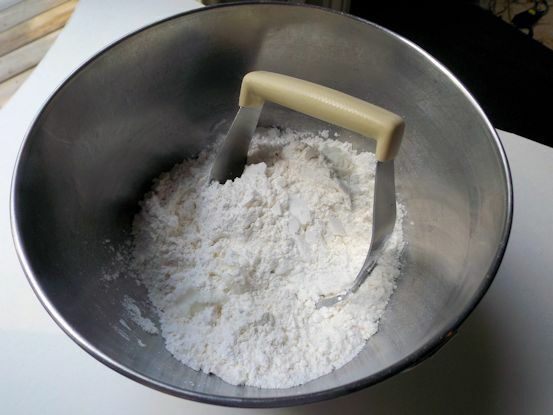 Use a pastry blade to cut shortening into flour. Use a fork to help blend in the water. 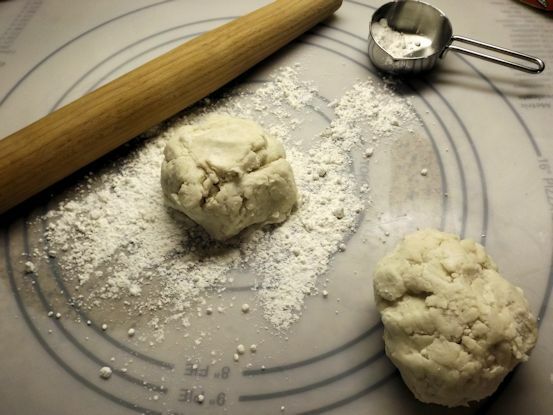 Roll out pastry on a floured surface. Roll from the middle to the sides to keep the shape round. 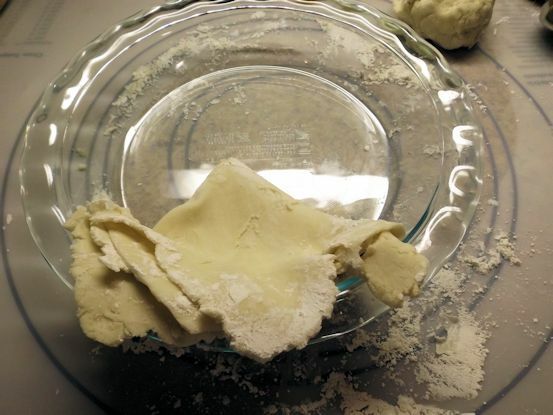 Use a knife or pastry blade to scrape up the dough. Fold into fourths and place in the pie pan. I am using a very deep dish pie pan so the dough doesn’t come up as far as it would in a regular sized pie pan. Place the apples in the pie pan. Sprinkle with an additional 1/2 cup brown sugar and 1/4 cup all-purpose flour. Dot with 3 tablespoons butter. You can also add cinnamon, nutmeg, ginger….I did not. 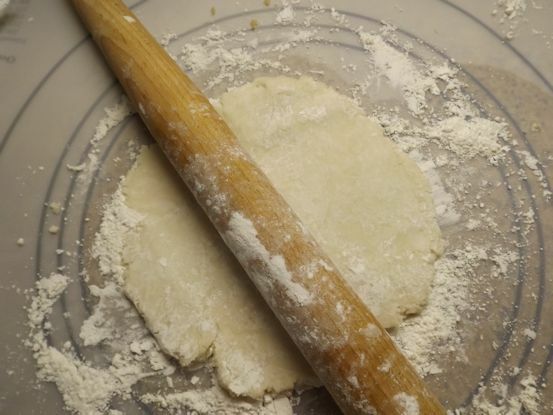 Roll the second pastry out on the floured surface. Fold it and place it atop the pie. 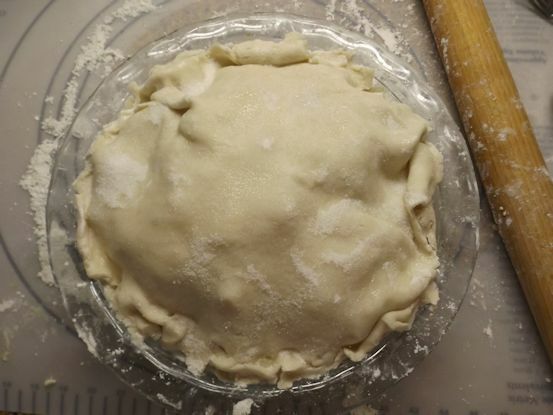 Normally, I would crimp it decoratively but since I was using the deep dish pie pan and the regular double crust, I don’t have the luxury of a nice overlap to crimp. I’ll call this rustic. Now, don’t skip this next step if you can spare more sugar in your diet. 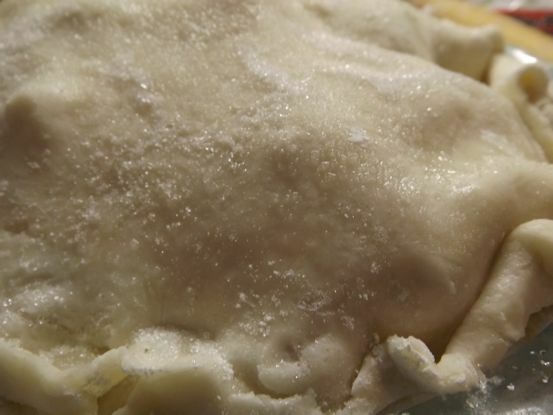 Sprinkle the top of the pie with water and then sprinkle with sugar. It will crust over and caramelize brown. 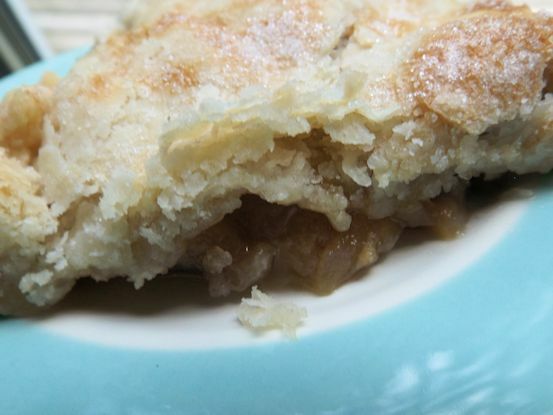 The crust was flaky and the apples were tender. 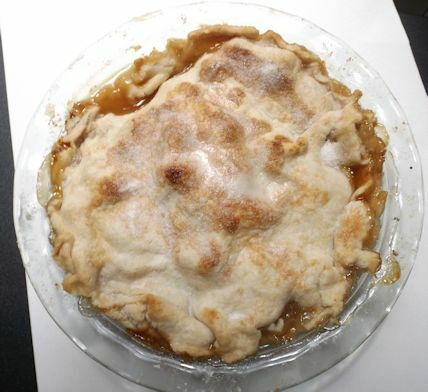 For me, apple pie is easy when you have the apples frozen and ready to go. Saves lots of time and the clean up is easier, too. SURE LOOKS GOOD TO ME. I’M A “PIE” PERSON!! !